The Murphy Administration announced that the New Jersey Transportation Infrastructure Bank is now offering low interest loans to municipalities and counties to reduce the overall cost of local transportation projects. New Jersey’s first transportation loan program, the Transportation Infrastructure Bank (NJTIB) is a partnership between the New Jersey Department of Transportation (NJDOT) and the New Jersey Infrastructure Bank (I-Bank). The NJTIB provides low interest loans for municipal and county transportation projects. 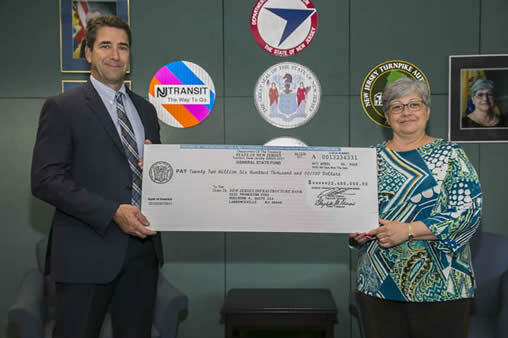 NJDOT Commissioner Diane Gutierrez-Scaccetti presents the I-Bank Vice-Chair Robert Briant Jr. with a $22.6 million check from the State Local Aid Infrastructure Fund, marking the launch of the New Jersey Transportation Bank, a partnership that will significantly reduce the total cost of local transportation infrastructure by reducing financing costs. Photo courtesy NJDOT.